This week, I’ve had a couple of things I really wanted to do. One of them was to get through the email backlog for The Bipolar Blogger Network; I gave myself permission to not answer and bin several in order to get caught up. If those folks message again, then I’ll hopefully be able to muster a reply, but this year has been not great for timely ability to handle emails. Which, of course, means the network was named one of the best bipolar health blogs of the year, but never mind. At least it’s ‘done’ for the time being. I’ve also really wanted to get out in the garden and weed. The weather has been fairly nice, and it’s a good excuse to get outside… but I keep finding excuses. I can’t go out because the baby is sleeping and I can’t hear her, or I’ve just had a bath, or any number of things. But then I also realize that I am feeling the bite of chronic fatigue and physical pain in a pretty severe way. I’ve had quite a bit of dizziness, and my aching joints make me feel like an OAP. I’m hoping that it’s just due to the leftover relaxin in the body postpartum, but eh. I try to keep moving as normally and smoothly as possible, as always worked to help me recover after PT evals when I was in the Air Force. Om nom nom, lemon cake. Mood-wise, things continue to be pretty darn well. I’m still managing basic chores and baking. Lots of baking. In the past two weeks, I’ve made chocolate cake, carrot cake, several loaves of banana bread, a pair of loaves of normal bread, and I’ve got chocolate chip cookies in the oven right now. 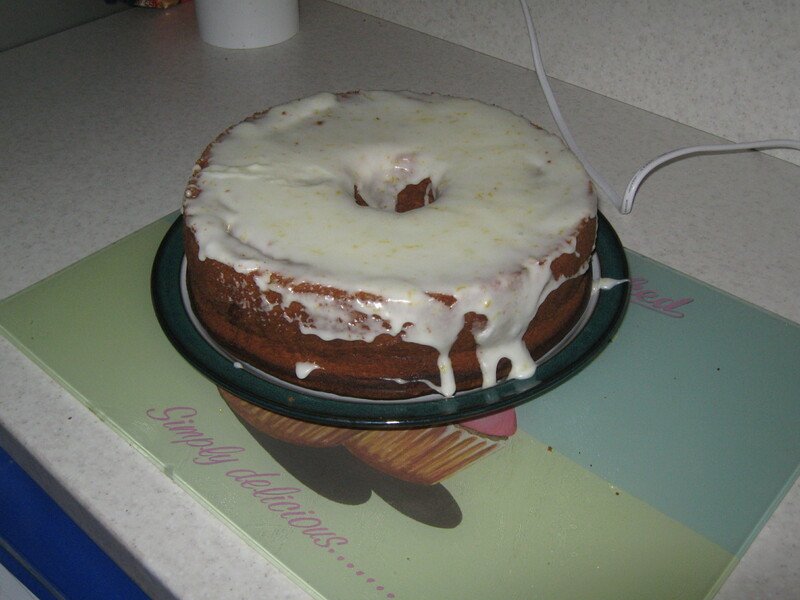 Oh, and lemon cake — I can’t forget about the lemon cake. Really, like knitting, baking is one of those things I like to do that helps my brain stay happy. It’s not about eating it; I prefer to bake than eat sweets. It’s just something that I enjoy doing, so I make a point to do it with some frequency. Plus, the kitchen setup means I can sit down while doing prepwork, which makes it easier to do with the ack-tastic chronic fatigue. I think the biggest thing doing my head in right now is a spike in insomnia. I’m not sure how long I’ve been reading in bed lately, but it’s not just because it’s a good book. Ever since I was a small child, I would read until I drifted off; it’s about the only way I know how to sort of kind of relax. It doesn’t help that I continue to have very vivid dreams. Am I just getting to sleep/waking up at the wrong time? It’s one of those things that seems to be rather damned if you do, or damned if you don’t. Ah well, whatever the case? I can be happy that my baseline functionality is decent these days. I still hope to be able to do more, but I am mainly contented with my lot.